I shot out a roll of film this past Saturday at the John Mueller Meat Co. located behind Kellee’s Place at the corner of e.6th and Pedernales in East Austin. Mueller was in a talkative mood so we repaired to the comforts of the old school bar and sat around for a couple hours drinking beer, listening to Little Joe, and talking about everything under the sun. At the end of the hang, Mueller made it abundantly clear, as I clambered on my bike, that every topic we’d breached was “off the record” and furthermore I had to sit on the scant info that could be made public til the morning of February 5th 2013. I have a lot of “off the record” conversations in Austin. And I plan on having many more so I did my best 1960s beat reporter imitation and kept a close vest. Til this morning. We’re living in some interesting times in the barbecue world. If you would’ve told me back in 1991 when I sat down to my first plate of Kreuz hot guts and brisket that we’d see this level of fascination with cooking meat with fire I would’ve laughed in your face. It’s good eating after all but I don’t think anybody saw the firestorm of attention barbecue is currently under-coming. And it will pass. Something else will come along that will fascinate and excite people and their attention will waver til one day they’ll realize they haven’t had a plate of ribs in 6 months and what was the name of that barbecue restaurant again? But for now we’ll all just keep on eating brisket plates and watching people lose their minds over talented cooks who’ve given their lives to smoke, meat and fire. 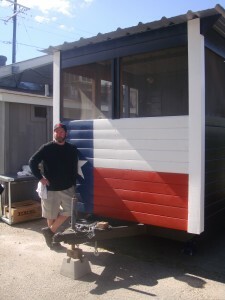 This entry was posted in Texas Barbecue, Texas Barbecue Photos and tagged Austin, barbecue, Brisket, east austin, hot guts, john mueller meat company, new location, Taylor Texas, texas. Bookmark the permalink.